You are currently browsing the tag archive for the ‘salade’ tag. Last November -that’s almost a year ago indeed- Annemieke from Rozemarijn kookt asked on Twitter who would like to receive her copy of A Vegan Taste of Greece, by Linda Majzlik. Of course I was interested and she kindly sent me the book. Shame on me that I didn’t cook from it until a couple of weeks back! Now why did I finally pick it up? Well.. There’s a PPK Cookbook Challenge on the Post Punk Kitchen forum. A vegan cookbook is chosen each week, and if you don’t have that particular book you can choose another from your shelves. This event coincides with Uniflame’s Cookbook Challenge on She Likes Bento. The difference between the two? PPK: any (vegan) book will do if you don’t have the designated title but you’ll need make at least three recipes from it. She Likes Bento: there’s no set amount of recipes to try (just one will do) but you have to choose an unused or hardly touched cookery book. A Vegan Taste of Greece was the only vegan cookbook I own from which I hadn’t tried a single recipe — so there really was no other first choice possible. After a short introduction on the origin of Greek food and its place in society, A Vegan Taste of Greece starts with an alphabetical list of a regular pantry, often including nutritional info. Nice! The rest of the book is divided into chapters focussing on different courses: mezedes, soups, main courses, vegetables, grain accompaniments, salads, sauces and dressings, breads, desserts and baking. I’ve made 4 recipes from 3 different sections: a main course, grain accompaniment and two salads, one green and one legume (bean). Each recipe indicates the amount of servings; mostly four but since it’s just the two of us here at Graasland, I usually made half of it. 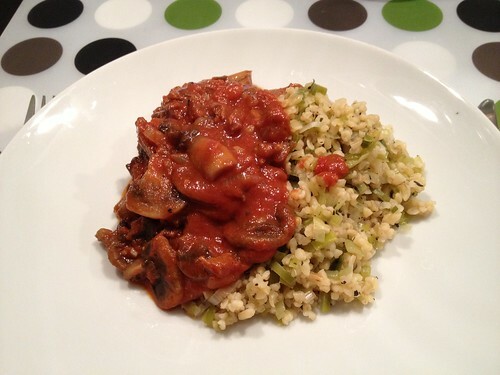 Briami is a vegetable casserole containing potatoes, courgette, red pepper, mushrooms, onion, tomatoes and a selection of herbs & spices like fennel seeds, rosemary and thyme. Wine and lemon juice provide additional liquid. The dish is finished off with olives and vegan cheese, for which I used a combination of faux parmezan and ‘rawmezan’ (a mix of ground nuts & ‘nooch‘, aka nutritional yeast). Sounds good, doesn’t it? Despite of all the flavourful ingredients I found the briami rather bland. :( It could have used more sauce and even then I’m not sure it would be really good. Maybe my expectations were too high? Mr Gnoe thought it was okay. The bulghur was… nice, but once more a bit dull. Admittedly I forgot to garnish with fresh mint. But I could hardly taste the dried peppermint that was also in it, and the leeks were so overcooked that they’d lost most of their flavour. I like leek, so it was another disappointment. I would consider making this again though: as an idea it’s more exciting than just wheat, it’s easy to make and a great way to add more vegetables to a meal. Next time I’d bake the veg separately until just done and combine everything at the end. It was a good combo with the seitan stroganoff though! 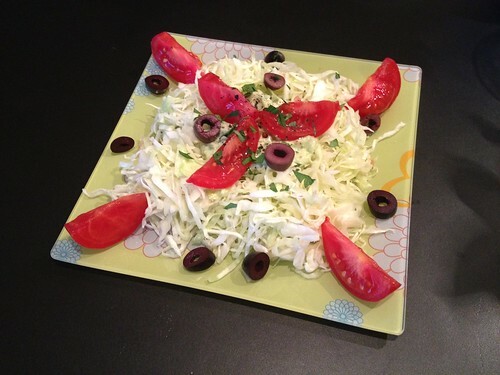 I’ve got this surprisingly good fennel-tomato salad recipe and avocado is one of my favourite fruits, so I was eager to try a Greek recipe combining them. The biggest differences between the two are that the fennel is cooked first in the new recipe and it doesn’t have basil & black olives but watercress (and avocado) instead. You can probably guess by now… Another flavourless dish. I expect Mediterranean food to be tasty! Furthermore, all ingredients were soft (not to say mushy) and I rather like a crunchy salad. My ideas for improvement? 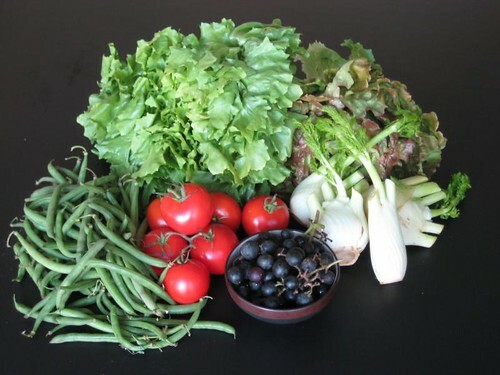 Keep the fennel raw, add olives & basil and maybe a little ouzo or other anise-flavoured drink. Of course having alcohol with your meal decreases the body’s ability to absorb vitamins, but sometimes there’s something to say for taste too. ;) But to be honest, I think I’ll stick with my regular fennel salad recipe. The last recipe, chickpea salad, was a small hit — the best of the bunch anyway. 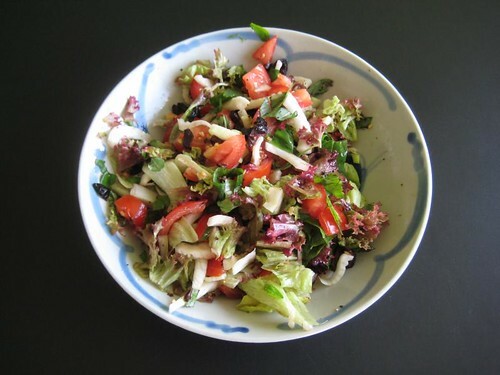 Especially considering it’s rather basic: a mix of cooked garbanzos, cucumber, a variety of peppers, red onion, black olives and a dressing made of skinned and finely chopped tomatoes, balsamic vinegar, olive oil, crushed garlic, fresh thyme and black pepper. I added a little salt as a flavour enhancer too. 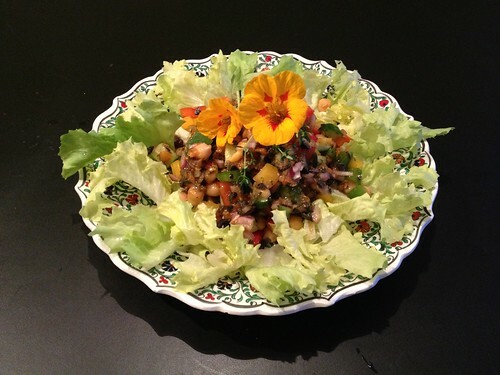 Yes, I will make this salad again when I have an open can of chickpeas! A mezé ~ walnut-stuffed mushrooms? Yellow split-pea spread fava? Courgette critters? Or jumping into the deep end with gyros made from scratch, finally using that bag of seitan starter I purchased? Dessert ~ baked nectarines or orange glazed peach slices, almond & apricot pastries… They make my mouth water. :) But all require the purchase of a new ingredient: orange flower water. And the baked beetroot in the vegetable chapter sounds like good too. So there’s more to explore before the curtain falls. I’d like to try one each from the categories above before my final judgement. Still, there’s a whole series of A Vegan Taste of… (France, India, East Africa, et cetera) by Linda Majzlik. Getting me to try another would require a copy to literally fall into my hands again. I hardly dare finish with one more flaw of the book.. :\ I think it’s partly a regional problem and doesn’t apply to Americans. MANY of the recipes use vegan cheese or yoghurt. I haven’t been able to find a good cheese substitute and feel reluctant to buy and use the varieties available here. In the US there’s Dayia… Reviews are raving so I’d love to get my hands on that! And soygurt… It lacks the sour freshness of its animal equivalent, which cannot be fully compensated by adding (extra) lemon. I just purchased a tub though, so I do plan on trying one of the recipes containing yofu too. If you’ve got one of Majzlik’s books I’d love to hear you think! 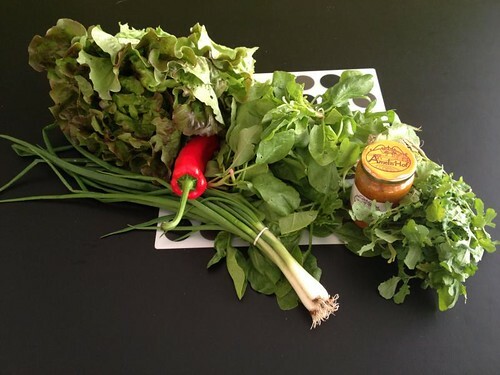 Join Beth Fish’s Weekend Cooking with a food-related post! So. I need to wash my greens right when they come in. I used to spin them dry and store ‘em in plastic zip-lock baggies. I reused these, but that doesn’t really feel like the most appropriate way for sustainable living with local veggies. 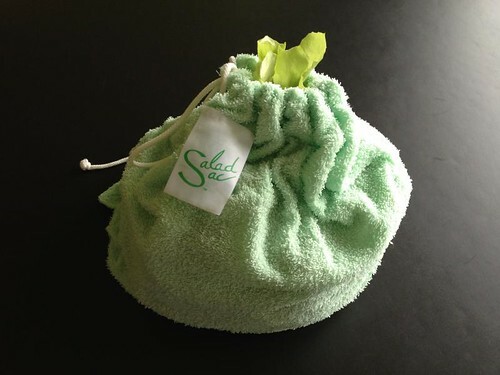 Now I’ve discovered the Salad Sac! Additional advantage: there’s one step less in the process because you don’t dry the leaves before they go into the bag – its wetness moistens the fabric so that the lettuce stays crisp and is ready to use. You know what? It works! 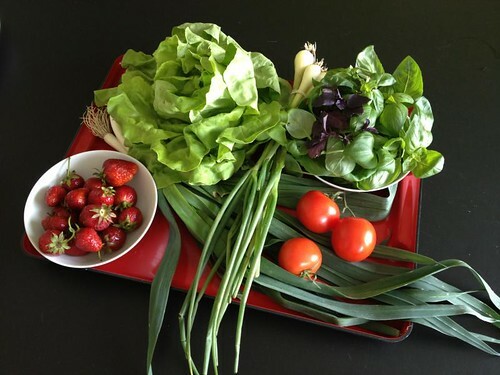 Here’s a pic that I took on the morning of our next CSA, when I had the last salad leaves of the previous week for lunch. A plus of plastic over cloth is that it’s transparent. As the salad sack is rather big I sometimes put several leafy greens in together and there’s a lot of digging around to get the right stuff out. Or Mr Gnoe doesn’t dare put in his hand at all as he has no idea what’s in there. ;) Then again, transparency would allow light to filter in, which is not helpful in keeping the vegetables fresh! But it would be wonderful if the bag came in different sizes. Of course I’ve thought of making some pouches myself… But I think it may be a special kind of terry cloth, maybe even treated (although it’s supposed to be 100% cotton). Any thoughts on that? I haven’t yet tried to put in things like sliced cucumber or other chopped vegetables. But the ‘instruction tag‘ says that works too! 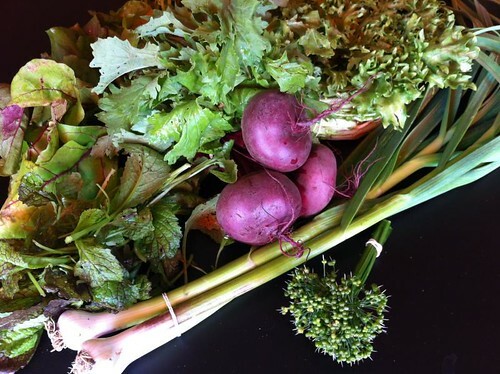 On with our colourful organic CSA vegetables of the past three weeks. 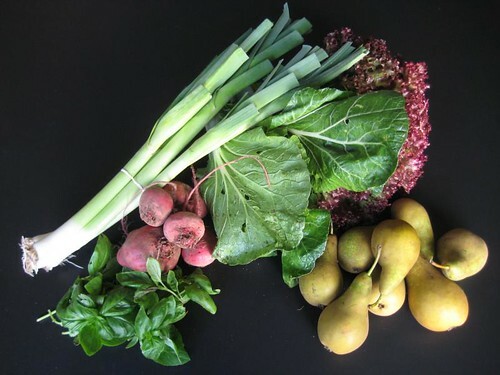 Don’t you just LOVE the purple of the beets and mustard greens? 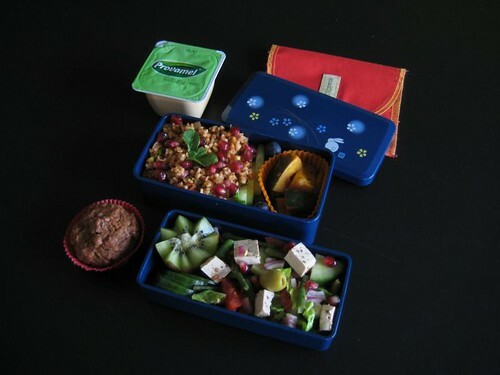 Thanks to the use of pomegranate, this Meatless Monday bento has a taste of the Middle East. I had a big day ahead of me so I took plenty of food! Upper tier: Ottolenghi’s kisir with pomegranate seeds and (homemade!) pomegranate melasse, cucumber and simmered kabocha pumpkin (freezer stash). Lower tier: kiwi fruit, cukes, Greek-style salad with haricot verts, faux feta and pomegranate seeds. On the side: breakfast muffin (freezer stash; recipe from Puur Plantaardig cookbook), and a caramel soy dessert that didn’t get eaten. Updating this post to submit it to the May 2012 bento of the Week challenge: isn’t this a great tease for a bento with NO CHEESE?! Quinoa salad with tomatoes, cucumber, spring onion, corn, bell pepper and more on a bed of lettuce. Cute red paper container with orange-basil tempeh as salad topping. Radish, fig, half a kiwi fruit, another kawaii container from Japan (sakura print) containg nutmix for salad (sunflower seeds, pepitas, pinenuts and pecans), apple bunny (usagi ringo) and cinnamon almonds. The almonds had sweated and gave my apple a sweet spicy taste — nom! Now where did I get those nice new paper foil containers? My friend MaaikeB and her family went shopping for me in Japan! 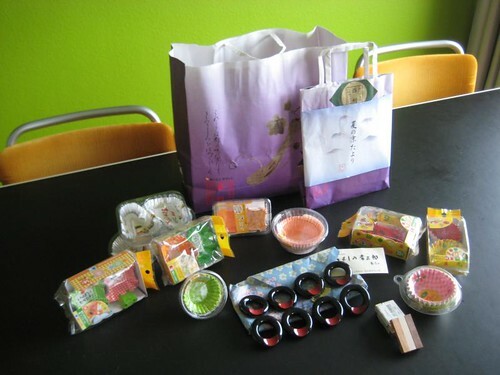 Here’s a picture of the goodies they brought back. I’m one happy grrl! Find more bentos at Shannon’s What’s for Lunch Wednesday (week 75). This food-related post is also submitted to Beth Fish’s Weekend Cooking! Lunch on October 13th: 2 sammies in a SnackTaxi bag and a bento box full of goodies. 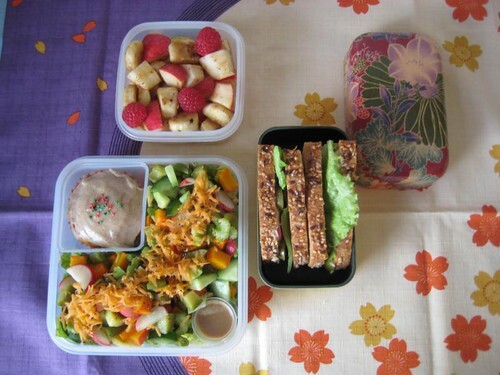 A picture of the sandwiches with hummus and vegan pate coming out of their bag can be found on Flickr. 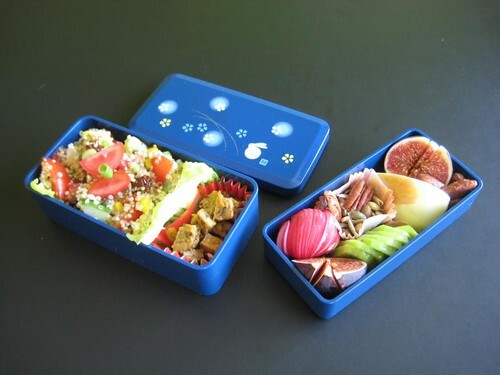 The bento contains carrot-cabbage salad with apple, walnuts and curry dressing on a bed of lettuce. Next to that is a star container with fennel caramelised in balsamic vinegar (recipe from the Ecofabulous cookbook by Lisette Kreischer) and pistachio nuts for gap fillers. In the small white container on the lid is a mix of sunflower seeds and pepitas for my salad. Tabbouleh in the other tier, tomato & basil, grilled oyster mushroom, green olive on usagi pick, half a spicy veggie sausage with roasted paprika sauce to dip (leftover from last night’s pizza), chigai-giri banana and a slice of my first ever tempeh bacon cut in three pieces (recipe from Vegetarian Food for Thought podcast by Colleen Patrick-Goudreau. 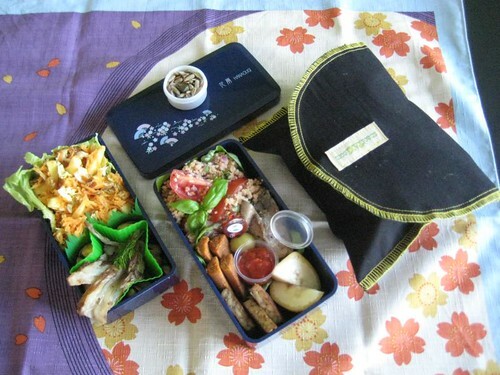 Clicking on the photo above will give you a little more of a close-up of this bento box. After that I’m up-to-date and ready to share this week’s bentos! Monday’s working lunch didn’t start out as a bento but turned into one anyway on its own accord. As you can see there’s a fall theme going on, with a hint of lingering summer! Upper container: fruit salad (raspberries, apple, pear, banana) with a dressing of lemon juice, agave nectar, cinnamon, black pepper, sereh, fresh ginger and dry mint leaves. Sammy box on the right: Flemish Christoph bread for a sandwich with hummus, lettuce, tomato, radish and garlic olive. Lower container: vegetable salad of lettuce & broad-leaved endive topped with a mix of radish, cucumber, gherkin, avocado, steamed green beans, oven-roasted pumpkin and ‘carrot confetti’. 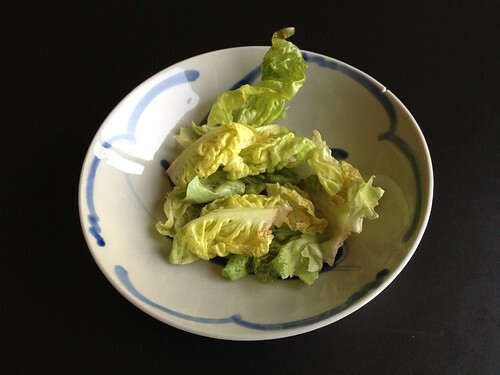 Red miso-sesame dressing. I don’t often bring sweets but this time I had a yummy homebaked pumpkin-ginger cupcake with cinnamon-vanilla frosting for dessert!!! 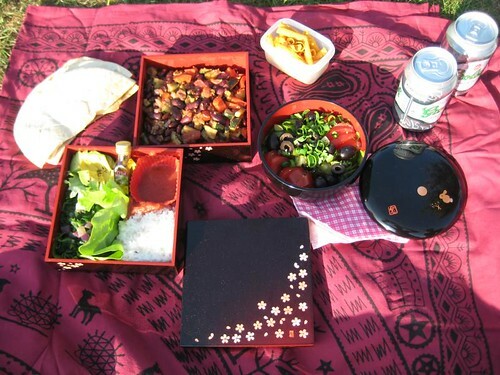 On Thursday, Ascension of Jesus — a national holiday, the weather was so good we decided to take our Mexican dinner to the park. A great opportunity to use my new sakura bento! Contents: flour tortillas with chili (kidney beans, zucchini & red bell pepper), rice, salsa picante, avocado with lime and sea salt, blanched spinach with red onion and jalepeño, salad (lettuce, tomato, spring onion, gherkin, black olives) with balsamic vinegar dressing and nachos. The beer is Grolsch, which I prefer over Heineken any day. My Monday lunch won’t be much of a surprise as I mentioned on Saturday it would contain quinoa. The following day I shared my Thai bean sprout salad recipe, revealing a tweaked version could be found in today’s bento too. Well, I was glad with my meal anyway. ;) I made the leftover quinoa stir-fry with kale chilli and nuts look fancy by shaping it with an onigiri mold. But looks come second and yes — it still tasted good (both with and without shoyu)! I hope someone can answer the following question for me. I know 25 grams of (dry) beans in a meal combined with grains provide sufficient protein. Now bean sprouts were mung beans just a few days before… And the nutritional value of sprouty greens is much higher concentrated than their full-grown adult versions. So: does eating bean sprouts and grains at the same time work as well? 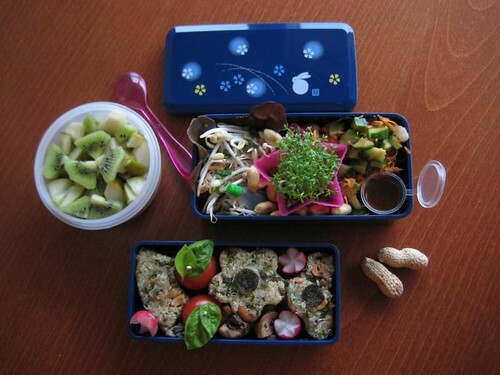 Other sources of protein in this bento are cashews, peanuts, mushrooms. Some people have asked me why on earth I make a menu plan. Well, here’s what happens when I don’t. We got this nice batch of veggies last week. So, after a delicious lunch of toast with fennel-tomato salad with fresh basil & black olives, I set myself to the task of making this week’s plan including as many of the greens as possible. 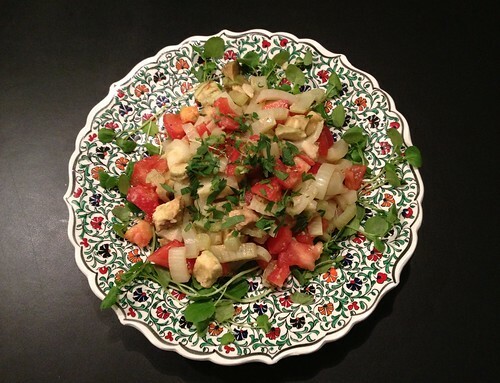 Recipes are coming from several of my vegetarian cookbooks and 1 or 2 websites. You may choose to add some salt, depending on how salty your olives are. You can also sprinkle on a bit of extra virgin olive oil but there’s really no need. Just a note on the side: eat this salad right away, do not let it sit for too long. 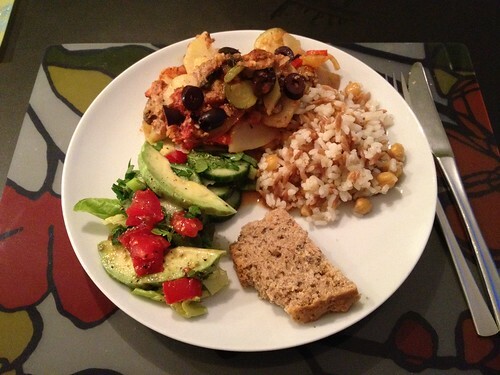 I’ve submitted this post to Midnight Maniac’s Meatless Mondays!